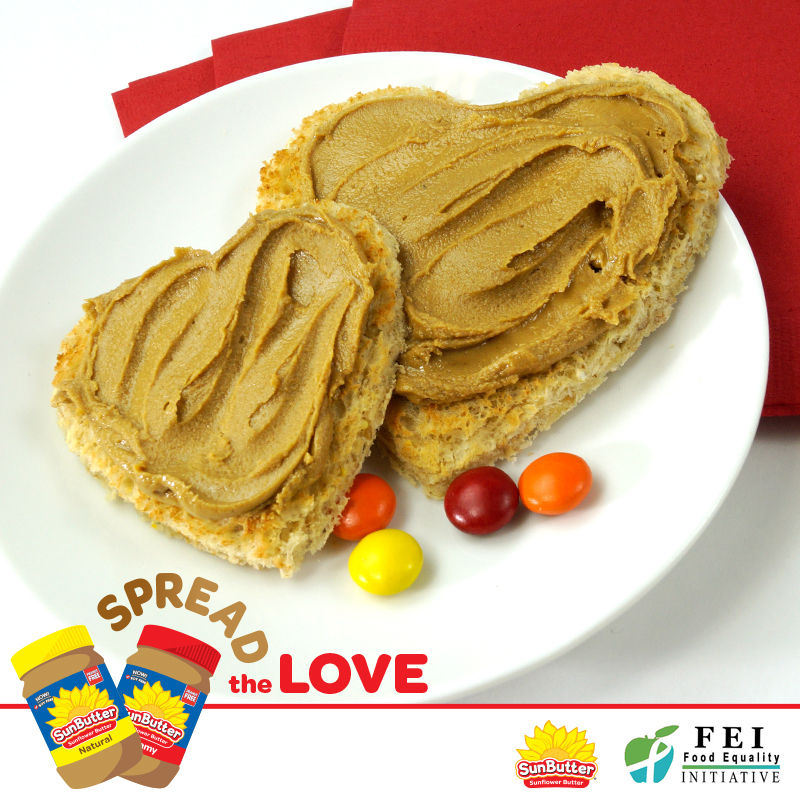 SunButter and Food Equality Initiative (FEI) announce the SunButter® Spread the Love Campaign. When you donate peanut-free, school-safe SunButter Sunflower Butter to your local Feeding America® network food bank in February – and register the donation below – SunButter will match your qualified donation. Donations must be made from February 1 – 29, 2016, and registered below to qualify (proof of donation may be requested). SunButter will match donations up to a total of 1,000 pounds total for the campaign, through a donation of SunButter Sunflower Butter to the Great Plains Food Bank in Fargo, ND. Find your local Feeding America network food bank here. You may also enter to win one case of SunButter for you, and one for the Feeding America network food bank of your choosing! Each week during the month of February SunButter will award one case of SunButter to one lucky entrant, and one case of SunButter to the winner’s choice of Feeding America network food bank. Five (5) winner’s will be announced on the SunButter Facebook page, and will be contacted via the email address provided on the online entry form below, on or about March 4th, 2016. To enter this sweepstakes, please fill out the online entry form below. Click here to view the official sweepstakes rules. Sweepstakes ends February 29th, 2016. NO PURCHASE NECESSARY. Void where prohibited. This campaign was launched to provide more peanut-free choices to Food Banks nationwide. One out of every five people with food allergies is food insecure, and purchasing allergy-friendly foods can place an additional burden on low income families with food allergies.